There is a belief among owners and managers of restaurants that the old technology is trustworthy compared to the newer technologies in the industry. You could ask why should you change something that has worked for years? This is especially true of the point of sale, or POS, system. Why should you trust your most important system to a new cloud system which may not work at all? However, in the brief period these systems have come into existence, they have proved some surprising benefits to cloud systems you should consider before going back to your old servers. A common complaint with purchasing new technology is that it will be expensive for a small business start up or existing location. However, many managers have saved money switching to cloud systems. Older server systems may be cheaper to install. However, there are plenty of hidden costs to having a computer server on your premises. These include everything from repair and maintenance bills to electricity. With a cloud system there is no server on site. This saves those hidden costs in exchange for a low monthly fee. Cloud POS systems grant you the ability to manage everything in real life. Instead of looking through a lengthy report before and after every shift, managers with cloud systems can view all sales, staff, and inventory in real time. All you need is a tablet or other smart device to see every piece of data about the restaurant. You can see how to make the restaurant more efficient and even head off problems before they happen with just a few clicks. In the fast-changing restaurant industry being up to date is critical. 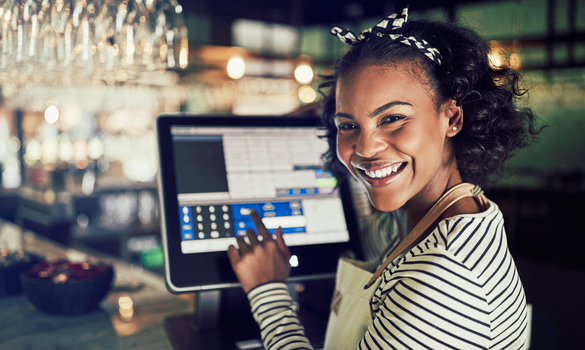 Whether changing the menu to reflect new tastes or changing your payment software to protect your customers, a cloud POS system can speed through the upgrade. With no hardware to change and a slew of compatible programs to choose from, any manager can easily make changes to update to a coffee shop POS system whenever needed. Mobile alerts and on potential upgrades also guarantee an end to the surprise upgrades that plague some server systems. Without a computer server hardwired to the cash registers, a cloud POS system can be run on just about any computer. Several companies in the space make ones that can even be safety used on smart phones and tablets. As a result, your waitstaff can take orders from the mobile POS and directly send them to the kitchen. No more wait staff having to remember until they reach the POS station, causing mistakes. Moreover, handheld devices can speed up table turnover, allowing the guests to pay from a table unit. Just as these devices are revolutionizing stores, they can revolutionize your restaurant. When data, such as orders or receipts, are taken into the cloud they are backed up multiple time. This encrypted back-up system guarantees that no matter what happens, you’ll have the data when you want it. Even if your business loses power, tablets and smart phones equipped with POS can still work on battery power and will still save transactions. This new tech guarantees that you will never lose needed restaurant data again by accident, period. These five points are just the tip of the iceberg. A cloud-based POS system is a categorical leap forward in technology. From how much it costs over time, to it protects you from data lose, to how it helps you improve your restaurant cloud systems are really in a league of their own. Despite what some will say, the old ways are not always the best ways.